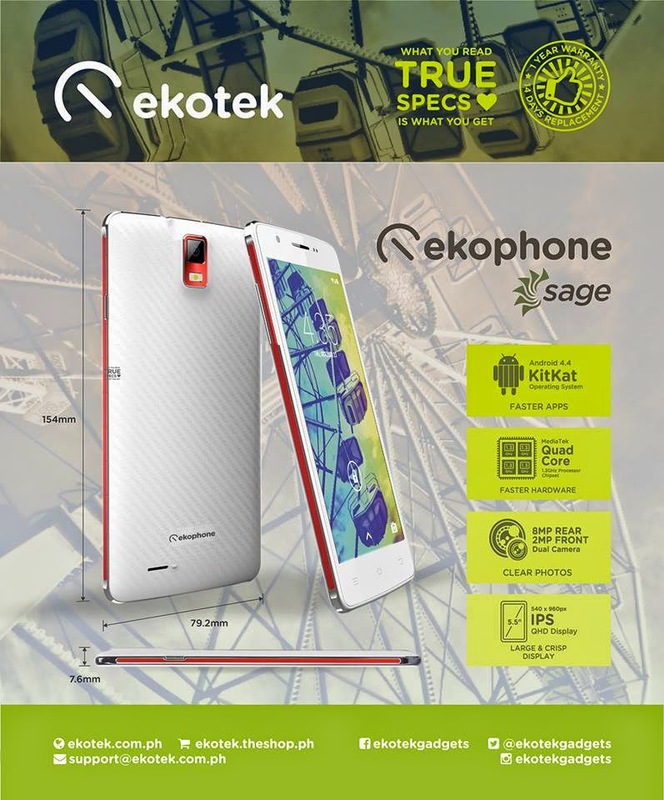 A new electronic manufacturer, Ekotek has just announced it's latest affordable smarphone called EkoPhone Sage. The new device features 5.5 inches display with 1.3Ghz Quad Core Mediatek MT6582 processor, 1GB of RAM, and 8GB internal memory expandable via MicroSD. Ekotek EkoPhone Sage is a dual sim/dual standby phone with 8 megapixel rear facing camera w/ flash and a 2 megapixel camera on front. The device support HSPA+, WiFi, WiFi hotspot and Bluetooth connectivity. For ₱6,499 price tag, EkoPhone Sage is running on an Android 4.4 Kikat OS with 1,900 mAh battery out of the box.